One of the bright spots of this bull market has been the oil and energy stocks. It is no secret that this sector is one of the highest relative strength sectors out there. 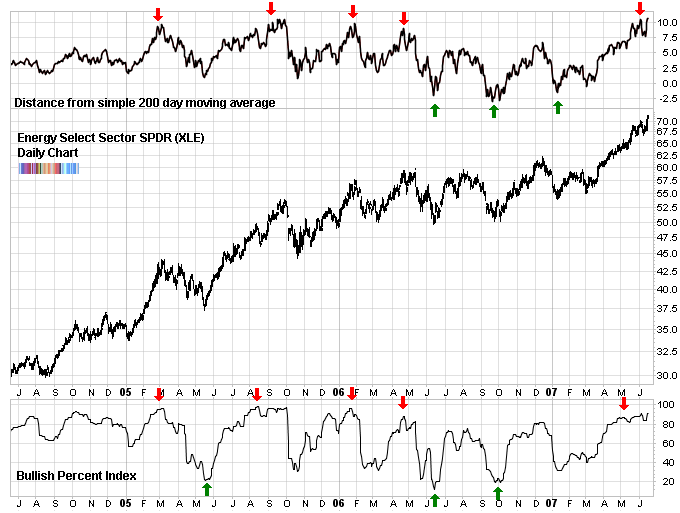 A great proxy for this sector is the Energy Select Sector SPDR (XLE). The chart looks great. A strong long term uptrend and a recent break out to new highs. But things are never that simple. Taking a look at the market internals of the sector shows that it is panting for breath as it reaches these new highs. As you’ll see on the chart below, all were great times to exit this sector and ring the cash register. The other side of this simple indicator was also quite telling. It reached a low in June 2006, September 2006 and January 2007. Each of those times were very low risk opportunities to go long. But it isn’t just the distance from the long term moving average which warrants caution. I like to see many different metrics confirm the same message. And that’s what we have right now. So lets go through a few of the really good ones. But the number of stocks above the shorter moving averages are also very high. There are 96% and 92% trading above their 10 day and 50 day moving averages, respectively. The latest ISEE call/put ratio for the Energy Select Sector SPDR (XLE) is through the roof. I haven’t bothered to check but I wouldn’t be surprised to find it to be the highest recorded ISEE ratio ever. This means that relative to puts, a tonne of calls were bought yesterday. Sure, that’s only one day, but nevertheless, not a good omen at all for the bulls. A great way to value oil stocks is to compare it to oil itself. The same way that we use the k-ratio for gold stocks. Lets call this the c-ratio (for crude). So we take the Energy Select Sector SPDR (XLE) and we divide by the price of crude oil. What we find is that when the ratio hits 0.70 or lower, that’s a great time to buy oil stocks. The higher the ratio, the less attractive the future performance of oil stocks. This is a rough guide but it makes sense. Oil stocks are for the most part the same as barrels of oil. The only difference is that oil stocks are comprised of oil under ground, while oil (such as light sweet crude) has been pumped up, refined and packaged. Right now, this ratio is 1.02 - not the highest level it has seen but definitely not the time to buy oil stocks (graph not shown). Finally, the bullish percent index is also confirming the ‘toppy’ picture for oil stocks. The bullish percent for the S&P 500 Energy Sector is at 91% right now. Technically, it can go higher to 100% but that is very rare. Historically, such high bullish percent readings have accompanied market tops (see graph below). I used similar indicators in my system for timing the Energy sector. In most cases, the energy sector would pull back when it reached extremes in distance above its 200 DMA, excessively bullish sentiment, and high bullish percent of 80 or greater. The exception was in the time span between 4/12/07 and 7/13/07. The energy sector remained in a persistent uptrend despite reaching extremes in all those categories.